Disclaimers: The Lord of the Rings was written by J. R. R Tolkien. I make no monetary profit from my fanfic. Waters of Serenity - Haldir goes for a moonlight swim - My second LotR fic. A Promise ~ A Hobbits Tale By Frodo Baggins - Frodo's thoughts as he travels to the Grey Havens with Gandalf, Haldir and the Elves. 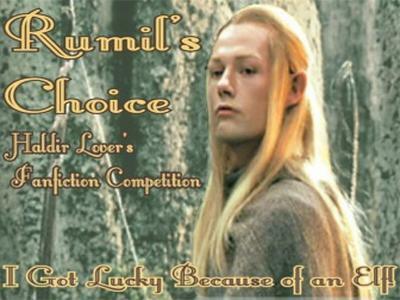 Lightly Sings The Wind - An Elven Lament - Winner of the Haldir Lovers Fanfiction Competition, Rúmil's Choice Award, March, 2006. Yay! More LotR fanfic to come! The Lord Of The Arches - Sauron's real plans for Middle Earth are uncovered. The Hobbit Pix Some stuff here!! LotR Funnies Some stuff here!! "A Wizard is never late ..."
"Even the wisest cannot see all ends"
"Not idly do the leaves of Lorien fall..."